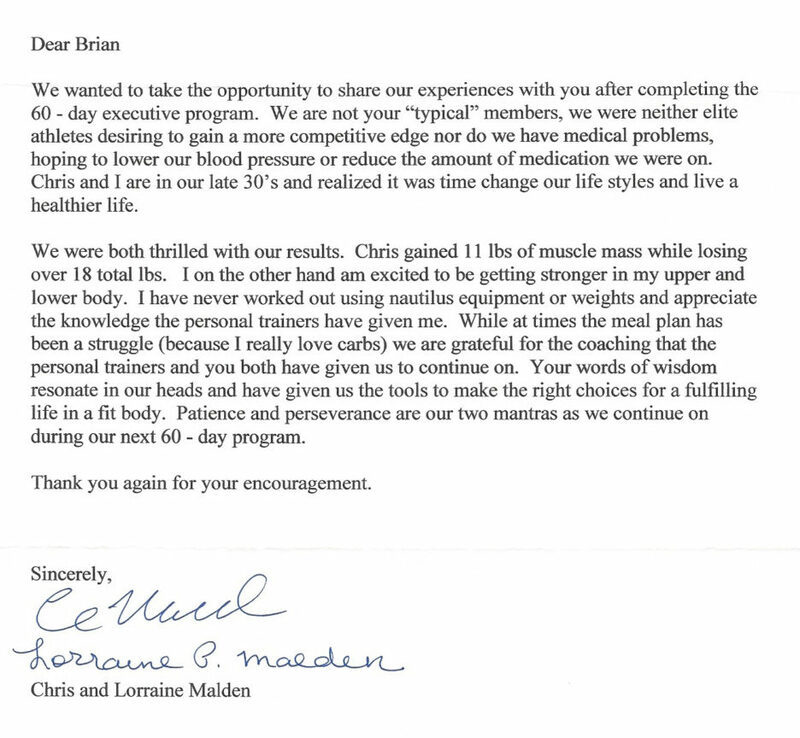 We wanted to take the opportunity to share our experiences with you after completing the 60 – day executive program. We are not your “typical” members, we were neither elite athletes desiring to gain a more competitive edge nor do we have medical problems, hoping to lower our blood pressure or reduce the amount of medication we were on. Chris and I are in our late 30’s and realized it was time change our lifestyle and live a healthier life. We were both thrilled with our results. 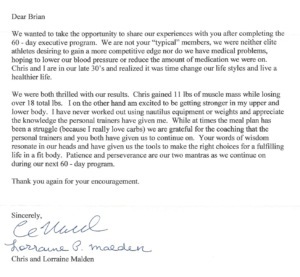 Chris gained 11 lbs of muscle mass while losing over 18 total lbs. I on the other hand am excited to be getting stronger in my upper and lower body. I have never worked out using nautilus equipment or weights and appreciate the knowledge the personal trainers have given me. While at times the meal plan has been a struggle (because I really love carbs) we are grateful for the coaching that the personal trainers and you both have given us to continue on. Your words of wisdom resonate in our heads and have given us the tools to make the right choices for a fulfilling life in a fit body. Patience and perseverance are our two mantras as we continue on during our next 60 – day program.